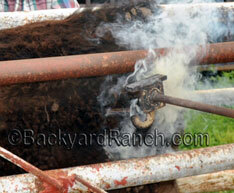 Picture above is of hot branding cattle for identification. Animal identification is one of the MOST important things you can do for not only disaster/emergency preparedness but also to guard against theft and loss. Your state animal health department can provide instructions on the location of the branding, hot or freeze brands, and what sizes are allowed. On their site they also have a link so you can find out which brands have been registered before you apply. It is very important to have your brand registered. Once registered, you will get a certificate good until the brand has expired (renewal every few years). Branding your cattle with your registered brand is for your protection against theft and an excellent form of animal identification. Hot brands are normally used on cattle for identification, but not recommended for use on horses. Horses have very thin skin. Freeze brands are better for horses. 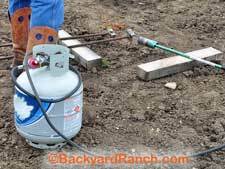 Freeze brands can also be used on cattle and at times make much clearer, easy to read brands. 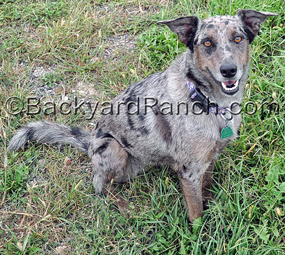 The key in getting your livestock and pets returned to you after loss or emergency is animal identification. If you can prove who you are and what animals belong to you, you will have the animals returned to you successfully. Above: A brood mare with a numbered neck band. 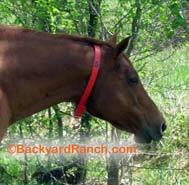 Animal ID tags on halters and collars. 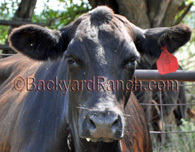 Above: A cow with an ear tag. 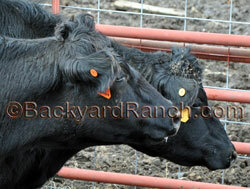 Above: A look at the back of a type of ear tag for cattle. Hot brands ready to brand cattle. 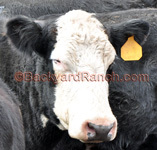 Ear tags for cattle often tell the number assigned to the cow (to track veterinary care and performance) and/or owner designation. They can be purchased in many different colors as well for even more accurate animal identification. When the cows calve, then the cows number will be written on it’s tag along with the calves number. This is for individual identification so that the calf can be matched to the correct cow. This will help the rancher keep the “pair” together when moving the herd, identifying sick animals and to track cow-calf performance. Make sure to have the basic preparedness steps down at all times.